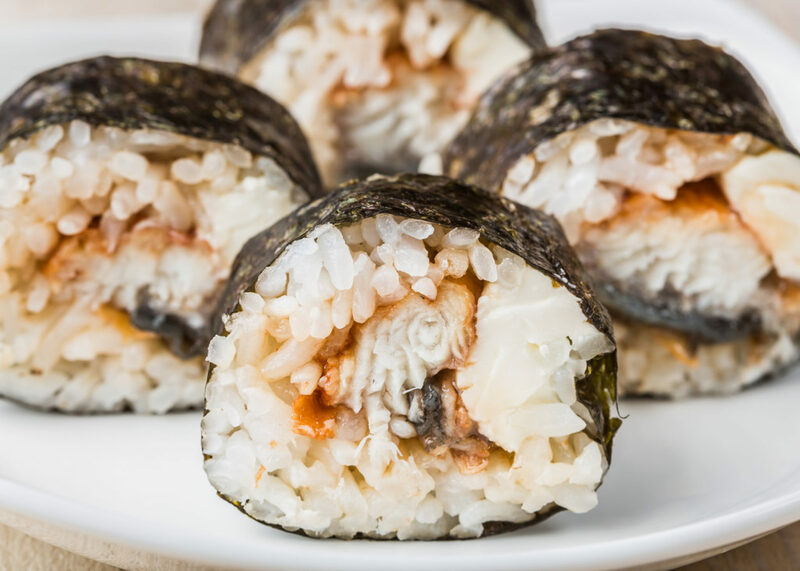 In a time long, long past, one of our readers suggested a roll that combines unagi (eel) and cream cheese. (Okay so it was only 4 months ago, but that’s almost SushiDay’s entire lifetime!) We finally got around to trying it, and Son and I definitely agree – it’s really good! It tastes very similar to the Philadelphia Roll, so this is a great alternative for those who aren’t so fond of fish but like unagi! Cook the unagi according to the directions on the package. Slice the unagi into thin strips, about 1/2 inch wide. Roll the sushi, using unagi and cream cheese as your fillings. HAHAHA, that is exactly what I thought to myself! Unagi!!! But he doesn’t like cream cheese… I think I can sneak a little in though- you guys didn’t use THAT much like many places do. (Isn’t he picky?! Yeesh.) I’m sick too =( Hmm…. too bad there’s no way to make soup-in-sushi… or IS THERE?! If there is, you’re the person I would ask to do it =) Feel better!!! You found my sushi weakness…I don’t like the texture of eel. Unagi is a speciality of our Prefecture Shizuoka! I did not know you could buy it frozen, though (well, that’s America for you!). I would add a large dollop of grated wasabi. I love this sushi roll! It might be because my favorite sushi is anago (sea eel). I like putting a little furikake in my roll as well. I know it’s usually put over a bowl of rice but I’m addicted to it in sushi. Very interesting. I love Philadelphia rolls but cant quite work up the courage to try the eel. You have the most beautiful photography at your site. Do you take these photos?! Since Wasabi originated from My own City (see article on shizuokasushi.wordpress.com), I’ll be glad to send you some at least once to let you know! Could you please check whether the Customs will allow me? If not, I will try to find a way! Ooh, yum, eel. I used to be scared of it too, before I tried it. Now it’s one of my favorites. Never tried making it myself though. Looks like I might have to give it a go. Eel is next on my try list though! Bethany – Mmmm that sounds good! Amy – Yay! I’m glad to be inspirational hehe. Actually, Son has been begging me to make a curry sushi… mind emailing me your recipe? 😀 I promise I’ll credit you! Hi Damien, I’m glad you like SushiDay! Mmmm that roll that you make sounds really good… I know Son would love it! (He loves spicy foods!) Thanks! You know…one can get grated wasabi here in the US. I get mine from http://www.wasabifarm.com. Although…I have never understood the real difference between a root and a rhizome. Is that the “root” of the issue? I found some frozen eel in a store and cooked it up in my bootlegged teriyaki style (stir fried w/ soy sauce, onion, a bit of ginger) and then rolled that w/ cream cheese and a cucumber for some crunch. delicious! i would love some pre-marinated, pre-cooked eel… b/c de-skinning and taking the spinal column out of the eel is a bit labor intensive for the small amount of meat you get. If you have a Japanese (or possibly any kind of Asian) supermarket near you, check there for pre-marinated, skinned, boneless, ready-to-cook eel. That’s what I buy, and all you have to do is pop it in the oven for a little while, then it’s all ready to go. No annoying bones or skin to mess with. sounds tasty since i love philadelphia rolls. but where is the difference if you say it taste like philadelphia rolls.